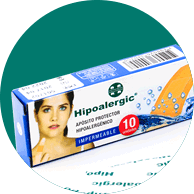 Plastic adhesive bandage, featuring an uniformly coated hypoallergenic pressure-sensitive adhesive and a highly absorbent pad in the center for covering and protecting the wound. Recommended for protecting small superficial wounds. Provides an excellent protection against possible infections and contributes to a faster wound healing. Stays on skin in the bath, shower or pool. Painless removal without leaving residues.